John Boyega looking about as happy as the guys were watching DETROIT. This week Dave admits why he’s way too excited about his car getting detailed, before Kris declares that his beard might be magical. Prior to the week’s main event, the guys serve up a heaping helping of recaps. Evan leads off with a segment of “Crewind,” where he offers his take on PHOENIX (6:06), a film that Dave spoilerpieced many moons ago. After he talks about his reaction to the German film’s incredible ending, he tackles SHINING THROUGH (10:35), the Melanie Griffith picture where she’s a sharp half-Jewish woman who spies on the Germans with Michael Douglas during World War II. Then Dave takes over with “Riedel’s Recaps” of I DON’T FEEL AT HOME IN THIS WORLD ANYMORE (20:43), a movie he liked more than Evan, who spoilerpieced it earlier this year, and THOR (24:41), which he was not impressed by. Finally, all three gents delve into DETROIT (34:01), Kathryn Bigelow’s chronicle of the brutality and murder at the Algiers Motel during the 1967 Detroit riot. In their commentary, the guys address criticisms leveled by other critics that the film is exploitative, while also sharing their personal reactions to it. David Kaluuya is hypnotized in Jordan Peele’s fantastic directorial debut GET OUT. This week Evan learns the meaning of the term “hippie lettuce” and the results are mind blowing, well to him anyway. Kris opens with a segment of “Keepin’ up with the Jensons” (at 4:40) where he talks about how great the performances in FENCES are and why he didn’t mind the Google Earth portions in LION as much as other people. Next, Evan shares his psycho stalker weekend. No he didn’t stalk anyone. He just watched THE BOY NEXT DOOR, FATAL ATTRACTION, and SINGLE WHITE FEMALE within two days and dug them all for their unhinged villains and insane plot twists. Lastly, the guys review the horror film GET OUT (at 30:38), Jordan Peele’s tremendous directorial debut, which they all had the privilege of seeing. They have so much fun spoilerpiecing their screening’s engaged audience, the sense of terrifying dread that Peele creates, and all of the subtle foreshadowing Peele lays down for the frightening events that follow, that they end up running a little longer than usual. Who knew that learning to work with cute little ants like this could be so fun and scary at the same time? Fan favorite Dede Crimmins from All Things Horror and Cinematic Essential joins Evan and Kris in this week’s episode. The three of them reminisce about QUANTUM LEAP and UNSOLVED MYSTERIES before Dede discusses her upcoming trip to the Fantasia International Film Festival. Once Kris and Evan recover from the recover from hearing the number of movies she plans to see, they ask her about some her favorites from the festival. Among them are DEATHGASM, SUBURBAN GOTHIC, and ABSENTIA. First, they cover Amy Schumer’s comedy TRAINWRECK, which is formulaic but a consistently funny human experience. 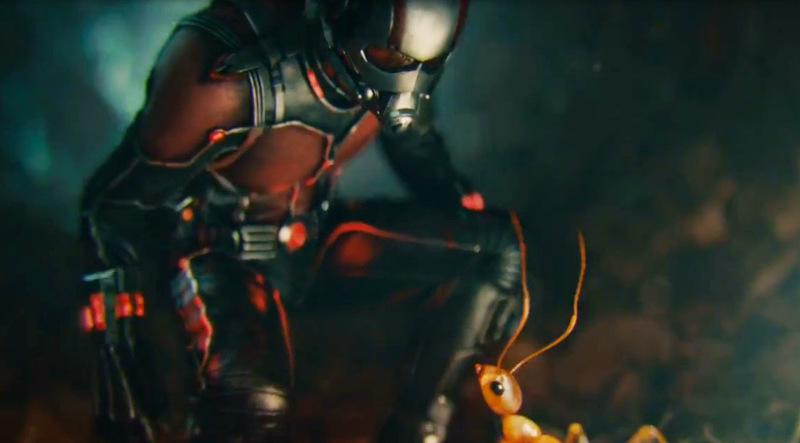 After they get a chance to discuss Judd Apatow’s shortcomings they move on to reviewing Marvel’s ANT-MAN, a heist flick that’s also a superhero movie. Kris thinks it has a breeziness that’s been desperately lacking in Marvel movies. Evan and Dede agree, while adding that Paul Rudd has evolved from just a pretty face into the total package as an actor.